NEW YEAR'S WEDDING BELLS AT YATELEY, HANTS. The ringers met at the belfry at 11.30, and cars began to come from all directions, the village soon becoming ablaze with light. The belfry was quickly filled in every nook and corner, and also up the stairs. Handbells were provided and exhibitions of change ringing were given which greatly interested the large company, many of whom saw for the first time the method of ringing and of the work carried out in our belfries. A few minutes before midnight the passing bell was rung, and as the clock struck the hour the Rev. F. R. Pechey offered suitable prayers for the occasion, including one from the Guild's service, and then gave the Blessing. The bells then rang out to the tune of Grandsire and Stedman, all ringers present taking a part. After many wishes for 1934, the company dispersed, but it is understood that some of the ringers visited the home of the president, where more good wishes were exchanged until all appeared tired out. Miss Macrae had always taken a great interest in the Yateley band, and everyone turned out and rang. The first touch wag 350 Grandsire Triples to allow Sailor Boy Cooper to ring, and conducted, by the head gardener of the bride's home, Mr. A. Goodall. This was followed by a quarter-peal of Stedman Triples, conducted by Mr. G. Butler, after which the whole company were lavishly entertained by Mr. Kenneth Macrae. New Year's Day, 1934, will be long remembered by the Yateley band, and also by many more who, for the first time in their life, began to think that there is more in change ringing than appears on the surface. It is a good thing to invite as many as possible to our belfries on the occasions of ringing whenever convenient. 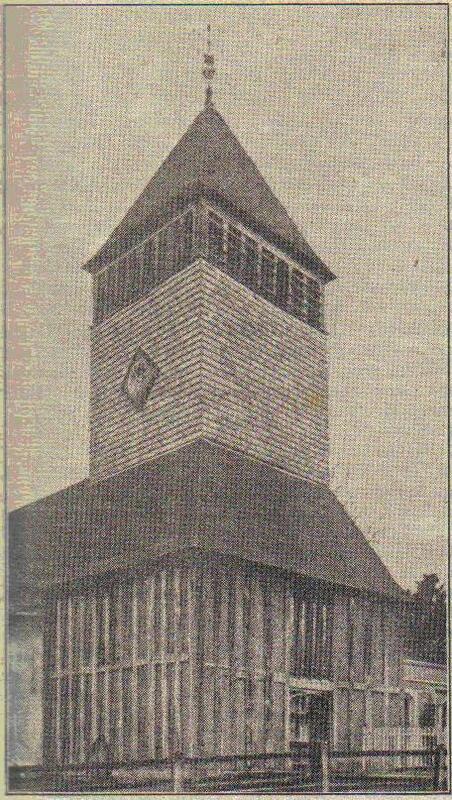 The wooden tower at St. Peter's Church, Yateley, was probably first erected by local talent. Later on it was shored up, underpinned and brickwork inserted owing to its sinking on the south side. Nearly 30 years ago the bells were going so badly, owing to the sway of the structure, that one of the ringers undertook to steel "flitch" the interior above first-floor level with 9in. by ¾in. flitches, and from that time the bells have gone very well indeed. The tower is covered with oak shingles. Treble.- "Ex dono Johannis Pakenham Stilwell, MDCCCLXXXVIII. Sanctus, Sanctus, Sauctus, Dominus Deus Sabaoth." (The gift of J. P. Stilwell, 1888. Holy, Holy, Holy, Lord God of Sabaoth.) Cast by Taylor, of Loughborough. Weight, 3 cwt 3 qr. 26 lb. Second.- "Ex dono Johannis Pakenham Stilwell, MDCCCLXXXVIII. Pleni sunt coeli et terra Gloria Tua. Hosanna in excelsis" (The Heavens and Earth are full of Thy Glory. Hosanna in the Highest.) Cast by Taylor. Weight, 4 cwt. 1 qr. 14 lb. Third.- "Sancti Petri sum, ex dono Johanuis Pakenham Stilwell, 1878. Sit splendor Domini Dei nostri super nos." (I belong to St. Peter. . . . May the splendour of the Lord our God be on us.) Cast by Taylor. Fourth.- "William Yare made mee, 1613." Cast at Reading foundry. Fifth.- "Sancta Katarina, ora pro nobis." (St. Catharine, pray for us.) Symbols, cat's head, cross in a circle, and a bunch of lilies. " R.E." (Richard Eldridge, of Wokingham.) Cast about 1555. Sixth.- "Love the Lord the God, and of E.H.S., 1577, TE.FR." Symbols, cross in double circle, a man with a beard, monogram FCJ in a rope circle, the figure 6, and a geometrical figure somewhat like a 5-pointed star between the letters TE and FR, Also a figure of a bearded man (? the Deity) holding the sun and moon. Recast 1921, the old wording and symbols being retained and the following added: "In memory of John Pakenham and Georgina Elizabeth Stilwell, by their children and grandchildren." Seventh.- "Our hope is in the Lord. R.E. 1617." Each word is followed by a heart. Tenor.- "Cast by John Warner and Sons, London, 1864. F.S." The Royal arms. Before it was recast, this bell had the following inscription: "Reprove mee not Lord in Thy wrathe. R.E. 1617" A heart between each word. Weight, 15 cwt. Note G.